In addition to our soundproofing products, we offer the best in soundproofing accessories for easy installation, repair, and more. 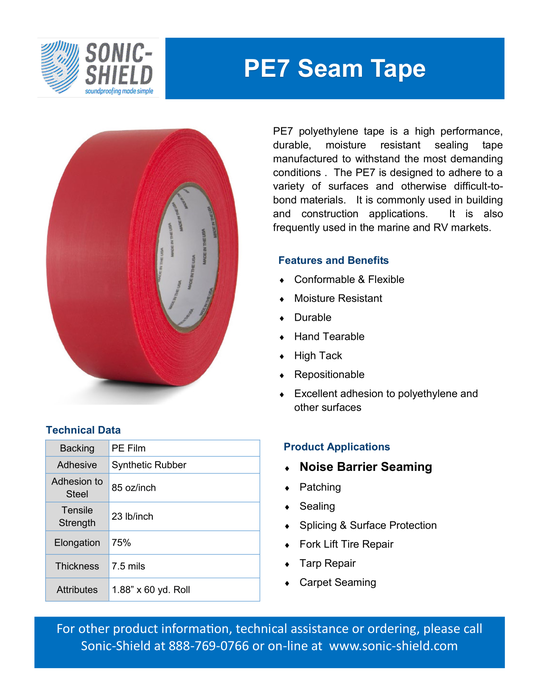 PE7 polyethylene tape is a high performance, durable, moisture resistant sealing tape manufactured to withstand the most demanding conditions. The PE7 is designed to adhere to a variety of surfaces and otherwise difficult-to-bond materials. It is commonly used in building and construstion applications. It is also frequently used in marine and RV markets. Learn more about PE7 Seam Tape. Our acoustical sealant is fire rated, non-flammable and strongly adheres to most substrates and won't harden, stain or migrate. Application is quick and easy and clean up is easy with soap and water. Acoustical Sealant Technical Data and Installation Sheet. Our putty pads are a single putty system with no mixing required and easy to install by hand.They adhere to all common building substrates, including electrical conduits. They don't contain any volatile solvents or asbestos fillers, making them safe for confined spaces. They also expand when exposed to heat and fire. The Isolation Clip is designed for use with any wood framed, steel framed, CMU, or concrete wall and ceiling system where noise control is needed. The Isolation Clip assembly decouples and isolates the gypsum/drywall board or plywood from the structure increasing the acoustical performance of the system. The Isolation Clips stop the noise and vibrations that typically would be allowed to transfer through the structure. The Isolation Clip systems have several UL fire resistive design assemblies ranging from one hour to four hours. Sound Isolation Clips Data and Installation Sheet. Sonic Fiber Stick Pins are insulation anchors with perforated 2" x 2" metal bases attached to 2.5" metal pins. Each pin is used for impaling and installing our various acoustical insulation materials. Pin diameter is 12 gauge and is used with self-locking washers. Perforated base insulation hangers are generally mounted using general purpose adhesive. Locking washers are used in conjunction with stick pins to fasten insulation in place. Contact our acoustical experts to further discuss our products, services or to receive technical data sheets.